Call it allergies, call it the start of the plague, but I know something is up. I feel great otherwise so I know that the best thing to do is take all preventative measures to stop this thing dead in its tracks. This usually includes a lot of water-drinking, antioxidant-eating, and laying horizontal for as long as possible. Since I have two jobs and no time to test out the “Don’t bother me I’m laying here to prevent myself from getting sick” theory, I’m stuck with the home remedy approach. I’ve often heard that ginger helps a laundry list of illnesses, including upset stomach, muscle pain, and congestion. It’s no coincidence that whenever I used to feel under the weather at school I used to go to the coffee shop where I worked and pick up a “Ginger Dragon”, a steamy drink that soothed my sickness and my soul. Now that I’m home and sick season is approaching, I figured I’d try to make my own concoction to keep in the fridge for days like today when I want to drink lots of fluids and feel all the great benefits of ginger. It actually came out great! It might seem like a hard recipe because, really, who buys ginger root? But it’s very simple and I’m already feeling better, so bookmark this if you feel like you’re coming down with something. First, boil your water in either a tea kettle or on the stove. While this is heating up, rinse your ginger root thoroughly and then simply chop it up into pieces (no method here, just in 1 inch pieces or so, nothing that won’t be stopped by a colander). Place the pieces of chopped ginger into a glass bowl (make sure the glass is durable and room temperature so it won’t shatter!) and pour the hot water over the ginger. Let the ginger steep in the water for 30 minutes. Drain the mixture through a colander to get all the ginger pieces out. You should now be left with ginger-infused water. The water should still be warm at this point. Squeeze the juice of all three lemons into the water and then slowly add the honey, making sure to stir so it melts into the water. You can always microwave the water again if you need to in order to help the honey melt. 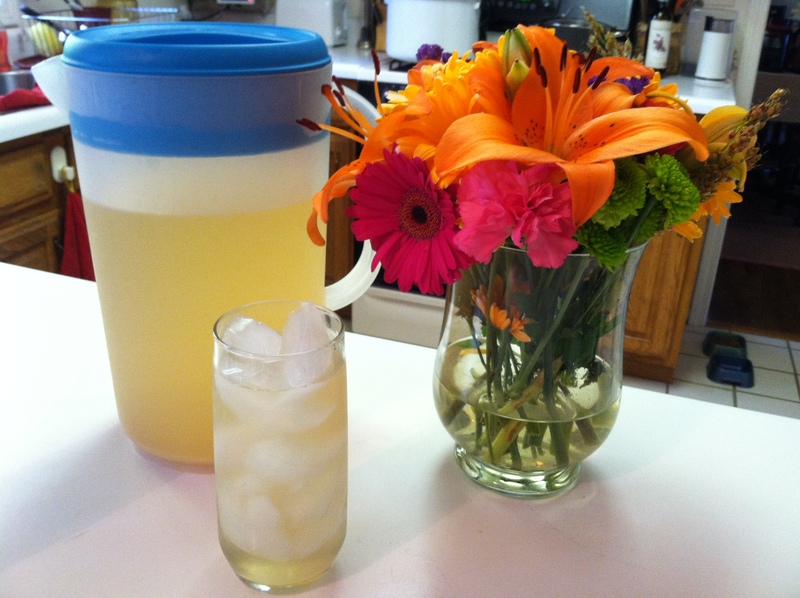 Once the ginger water, lemon juice, and honey are all mixed together, pour it in a one gallon pitcher. It won’t be full, so just add cold water until the pitcher is filled up. Stir the whole thing and then store it in the fridge. Remember, it’s all about what your taste preference is. Mine turned out just the way I like it, but you might want to add more honey or dilute it with even more water. It’s totally up to you! I’m drinking mine chilled now but it’s also great as a hot drink, especially when you have a full-blown cold. Something about the mixture of honey, lemon, and ginger is comforting and cleansing. What’s your favorite way to ward off sickness? Oh this looks good! – ginger and lemons being added to the shopping list as I type! I drink ginger tea whenever I am sick!!! But the real ginger kind like this. So many better than ginger flavoured tea. Love this recipe!